Get ready for family travel with the newest offering from the market leader in lightweight, affordable luggage, Atlantic®, where, as they say “Life is a Trip!” The Unite™ 2 collection will make your imagination take flight with design innovations such as the Link2Go™ System which connects luggage together, so you can easily push two pieces with one hand. 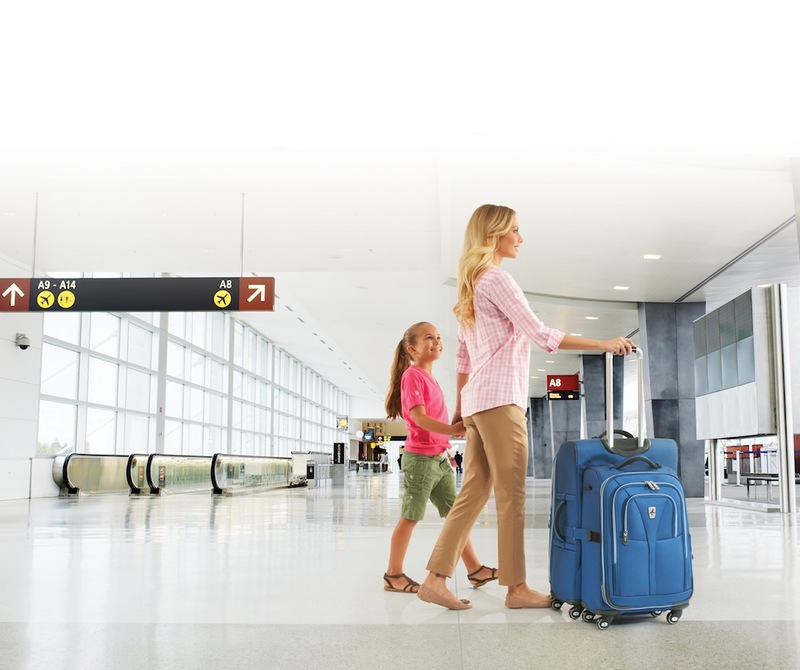 This system gives traveling families the option to roll more pieces, more easily by connecting luggage together, allowing you to roll through busy airports with much less effort. The Atlantic Unite 2 collection with the updated Link2Go system is a unique way to attach two attractive Spinner models together. It couldn’t be easier. Just connect the Spinners back-to-back with the side Velcro straps and you’re ready to go. 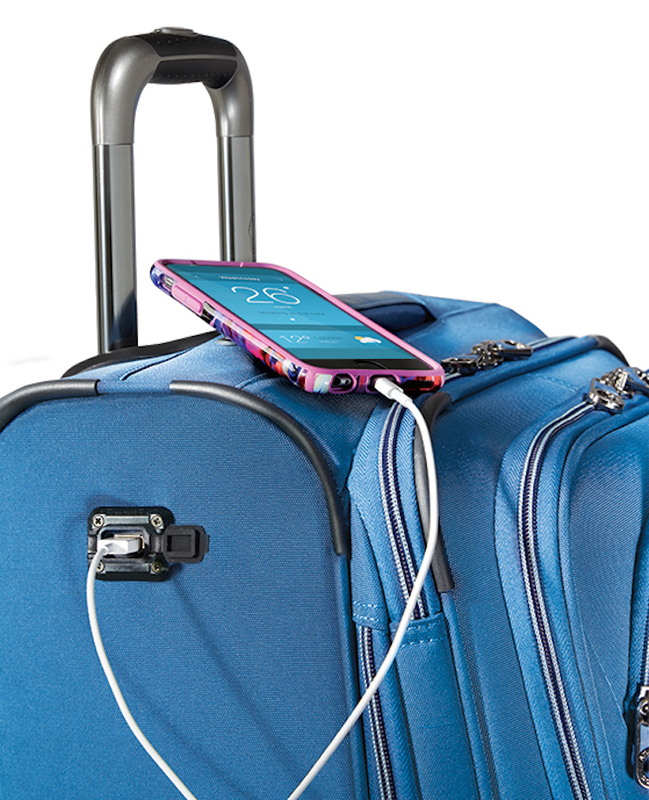 In addition, you can roll up to four pieces at once using a combination of a quick loop on the back of the carry-on models and the Link2Go system. But the exciting new features don’t stop there. How convenient would it be to charge your smart phone or tablet while traveling? Atlantic has solved that problem with the addition of an external USB port and integrated battery pouch in the Carry-on Spinner model which provides convenient access to power electronic essentials on the move. Masterfully versatile and lightweight, the affordable Unite 2 is perfect for family travelers who need an extra hand and electronic devices that are always charged for immediate use. 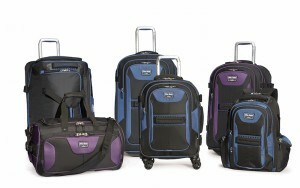 “This stylish collection is value packed in every component, including tapered expansion which adds up to 2″ of room while increasing stability, durable crash protection, and 360 degree spinners which roll effortlessly,” said Scott Applebee, Vice President of Marketing for the Travelpro family of brands which includes Atlantic luggage. Pleasing even the most demanding customer are additional features such as multi-stop telescoping handles, low-profile carry handles, and a mesh lid pocket that provides handy space to keep shirts and blouses wrinkle-free. The Atlantic Unite 2 Collection also includes adjustable hold down straps, a side mesh pocket, and a built-in wet pocket, perfect for storing toiletries or wet clothing. In keeping with Atlantic’s commitment to quality, the Collection comes with a 10-year warranty. 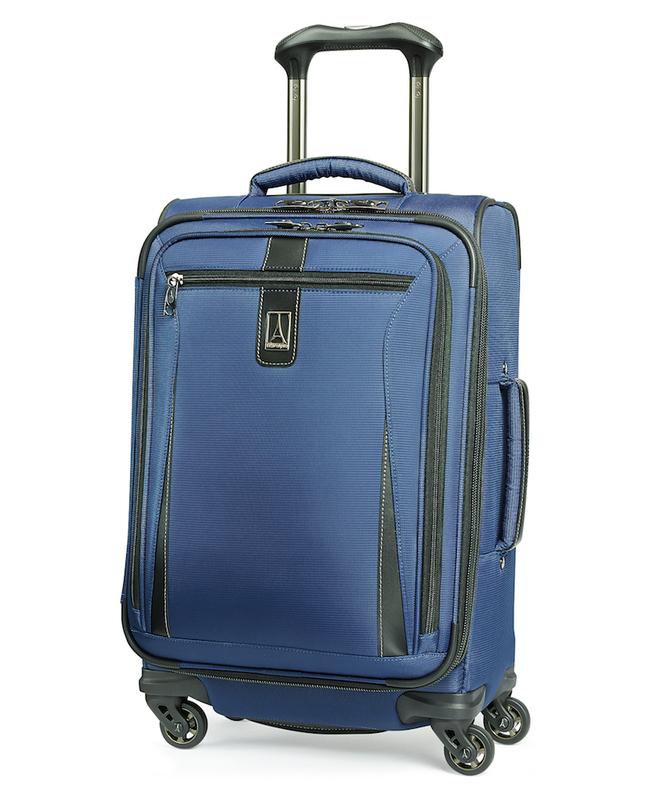 Available in black and blue fabric colors, the Atlantic Unite 2 Collection consists of a soft tote, wheeled tote and 21″, 25″ and 29″ expandable Spinners. 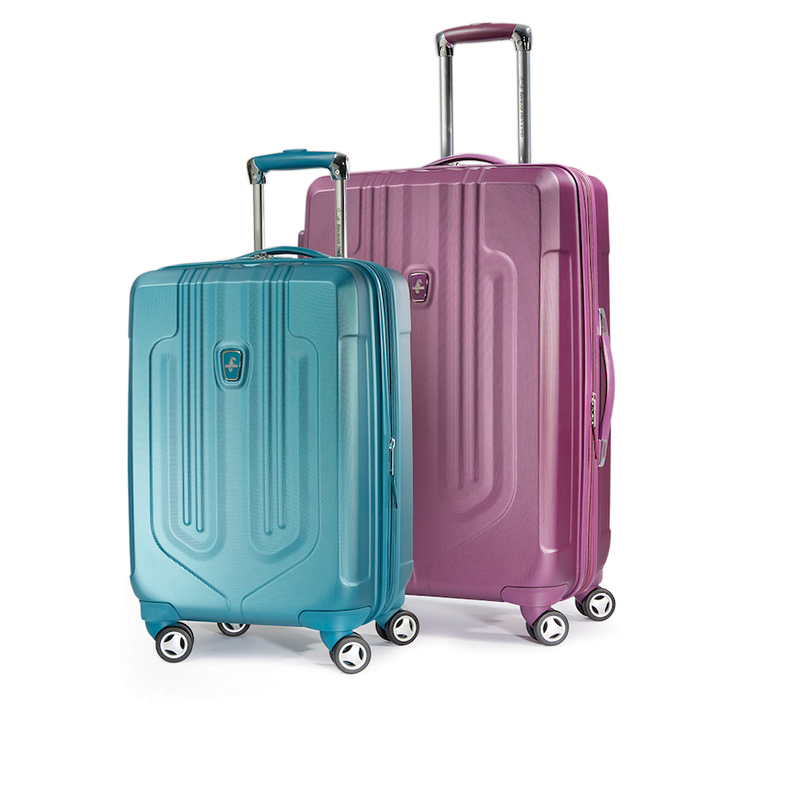 Ideal for family travel at a price that won’t break the budget, the Atlantic Ultra LITE Hardside Collection of Spinners meets all your needs with lightweight luggage that is not only high quality but stylish as well. 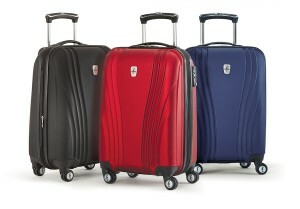 Made with a scratch resistant hard shell case and high-mileage wheels like the company’s more expensive luggage, this attractive trio of Spinners is feather light and amazingly durable. 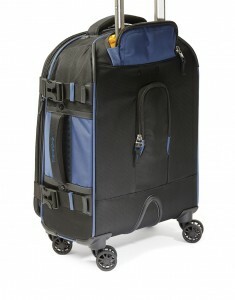 Available in three distinctive colors — black, turquoise and purple – and in three sizes – 20″, 25″ and 29″ – these pieces include 360 degree spinner wheels which roll effortlessly in any direction, retractable aluminum-grade extension handles with multiple stops for users of different heights, and protective wheel housings for crash protection. The Collection features expansion capabilities for extra packing, high-mileage dual Spinner wheels and the strength of a protective hard shell. A stylishly textured finish resists abrasion over the long haul. You can buy with confidence knowing that each piece comes with a 5-year warranty. Since 1919, the Atlantic brand has been synonymous with affordable, value-added and lightweight luggage. 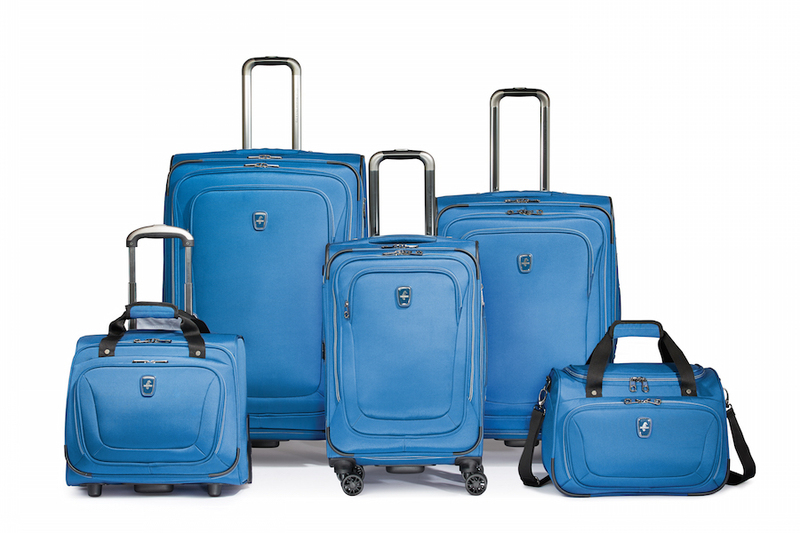 As a market leader in the lightweight luggage segment, from cleverly designed uprights and spinners to trendy and smart garment bags and totes, all Atlantic-branded luggage comprises superior quality and durability. Whether for business or recreation, travel is more pleasurable with Atlantic luggage, part of the Travelpro family of products. Please visit the Atlantic Luggage website for a full list of the latest products and retail locations. Ideal for families who like to travel, Atlantic is offering the chance for a grand prize winner and three guests to win a fabulous trip to Orlando, Florida. The winner will receive roundtrip airfare for four (4); three (3) nights at a 3-star hotel in Orlando; Four (4) 2-day passes with admission to 34 of the best Orlando attractions; $150 cash spending money; and four (4) Atlantic carry-on sized suitcases. The sweepstakes begins May 15th and ends June 15th, 2015. To enter or view the official sweepstakes rules, please visit the sweepstakes website. No purchase or payment is necessary to enter or win. The Atlantic Lumina group of luggage. Ideal for families who like to travel, Atlantic is offering the chance for a grand prize winner and three guests to win a fabulous Delta Vacations trip to either New York or San Diego. 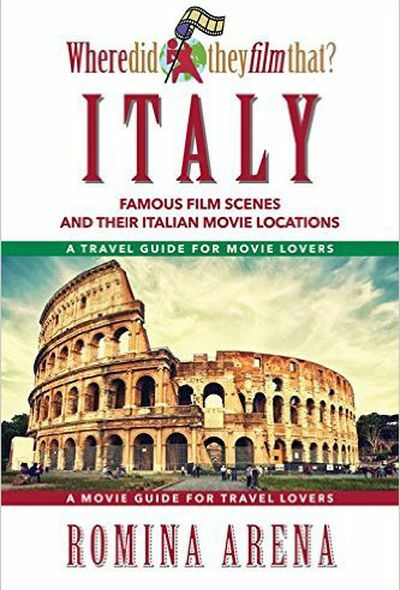 The winner will receive a certificate valid for roundtrip airfare for four (4); choice of Delta Vacations hotel accommodations; an activity package; and four (4) Atlantic carry-on sized suitcases. Round-trip economy airfare for four (4). The sweepstakes begins October 15th and ends November 15th, 2014. To enter or view the official sweepstakes rules please visit the Atlantic Luggage fall sweepstakes page. No purchase or payment is necessary to enter or win. Delta Vacations is the official vacations provider for Delta Air Lines and offers convenient one-stop shopping for affordable vacation packages that combine Delta Air Lines or Delta’s codeshare partner flights with hotel stays, rental car, sightseeing and entertainment, escorted tours and more. Delta Vacations, in partnership with Air France Holidays and Alitalia Vacations, originate from more than 220 cities across the United States and Canada. Destinations include more than 4,000 world-class hotels and resorts throughout Mexico, Costa Rica, the Caribbean, Europe and Asia. Delta Vacations is managed and marketed by MLT Vacations, a wholly-owned subsidiary of Delta Air Lines. 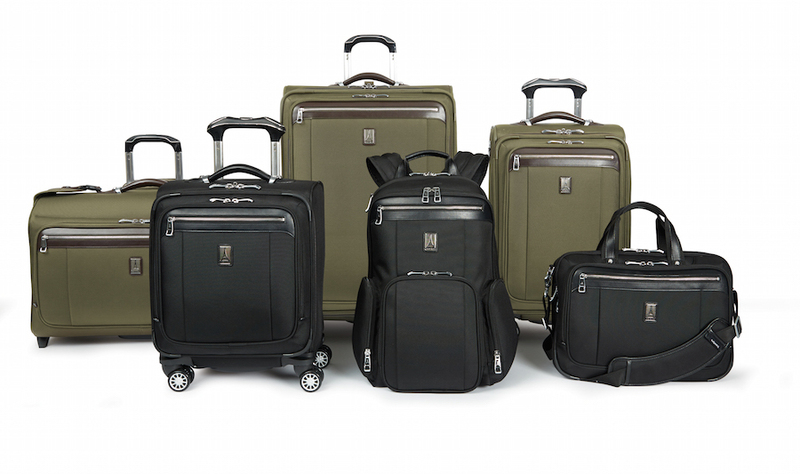 Travelpro, the inventor of Rollaboard luggage and a market leader in innovative, high-quality luggage design, is pleased to debut the revolutionary Crew 10 Hardside Spinner Collection. This creative collection provides the perfect combination of durability, technology and style for today’s frequent travelers. Travelpro’s Crew 10 Hardside product line incorporates the most sophisticated technology for Hardside Spinner luggage in today’s market. Featuring its patented PowerScope Extension Handle that minimizes wobble and with stops at 38″ and 42.5″, the Crew 10 Hardside line ensures that travelers of varying heights can comfortably maneuver through crowded airports and airplane aisles. The Crew 10 Hardside is constructed from 100% polycarbonate material, engineered to withstand high impact handling and the rigors of long distance travel, while still being lightweight. The roomy main compartment expands up to 2″ to maximize space and flexibility for difficult return flight packing. A deluxe hold-down system secures clothing while keeping it wrinkle-free and features mesh pockets for extra storage and easy-to-adjust straps with Duraflex anti-break buckles. Packed with innovation, the Crew 10 Hardside Collection’s 19″ Business Plus Spinner includes a convenient mobile office in the front pocket that holds pens, smartphones, cords and adapters for easy access on the run. Additionally, a separate built-in padded sleeve provides electronic travel protection for up to a 15.6″ laptop or tablet. The entire collection is available in both stylish merlot and elegant black, and is backed by a lifetime warranty on materials and workmanship. We don’t often talk about our luggage on our blog, but we’ve come up with some innovations that we think will improve travelers’ experience. 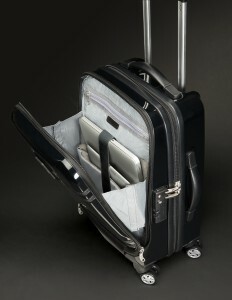 The changes to our products were far from cosmetic, and designed to solve a common issue with modern luggage: stability. 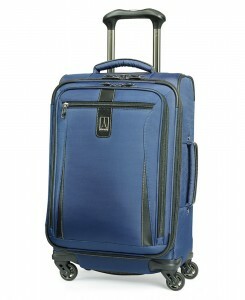 When using four- or eight-wheel spinner luggage, the luggage has a tendency to swerve to the left or right. This puts a strain on the traveler’s wrist and shoulder as he or she compensates to keep the luggage moving in a straight line. This isn’t unlike a car whose wheels are out of alignment. In order to keep the vehicle in a straight path, the driver must constantly correct the direction. We came up with a solution to the drifting issue by designing our patent-pending MagnaTrac Spinner wheels which incorporate magnetic wheel technology. Made specifically for spinner luggage, we created a system where the wheels will always line up and go straight, but can still be turned easily. The result is less strain on your body, which can mean a more enjoyable (or less tiring) trip. We also introduced two other patented features, the Contour Grip and the PowerScope handle. Contour Grip is a handle specifically designed for use with Spinner wheels. The handle is made from two cushioned halves that fit directly into the palm of your hand, cushioning it while you push your bag through the airport. This improved handle gives you more comfort and control of your luggage, regardless of whether you push or pull. The Powerscope Handle is made to resist the pressure points that form when pushing luggage and reduce the wobble in the handle. This gives you more control over the bag, and helps prevent breakage. All three TravelPro designs won awards at the Travel Goods Association Product Innovation Awards in 2012 and 2013, including 1st place for the MagnaTrac™ Spinner innovation. 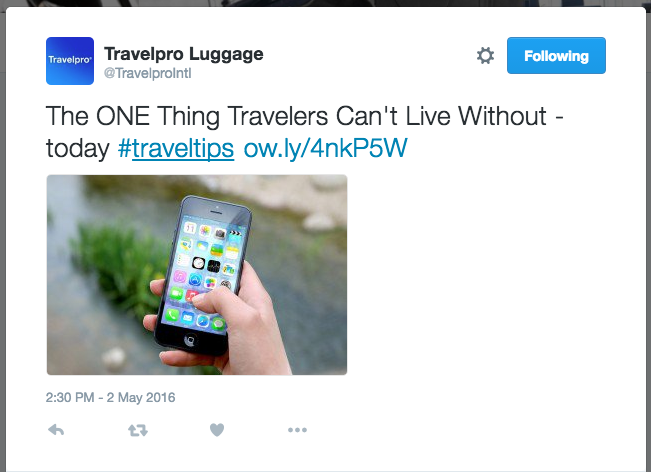 These designs will be applied to multiple Travelpro product lines so the improvements can fit within most travelers’ budgets.